Voxel Probe is a light source which provides static voxel lighting and shading on an object inside the probe by using a prebaked 3D lighting map. 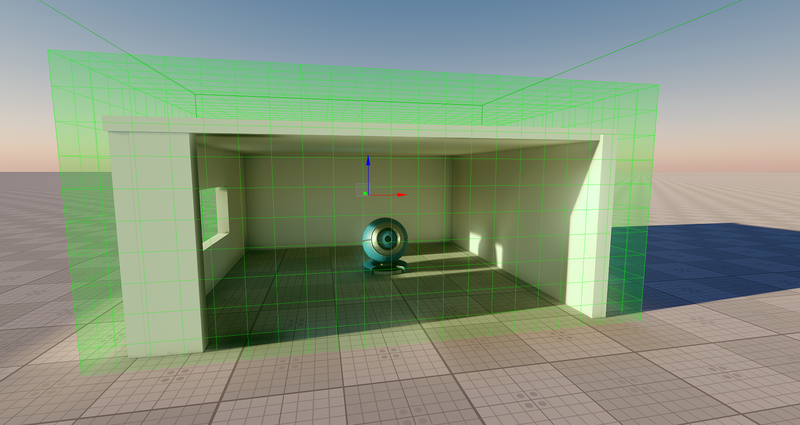 Unlike Environment Probe, Voxel Probe provides physically accurate light spreading inside interiors and outdoor static scenes but supports diffuse reflections only. Also, Voxel Probe is great solution for shading dynamic objects within static areas. Voxel Probe provides box volume compound of voxels and contains parameters used for light baking inside it. 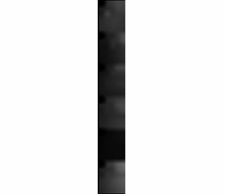 Each pixel of a texture defines the illuminance of a certain voxel face. 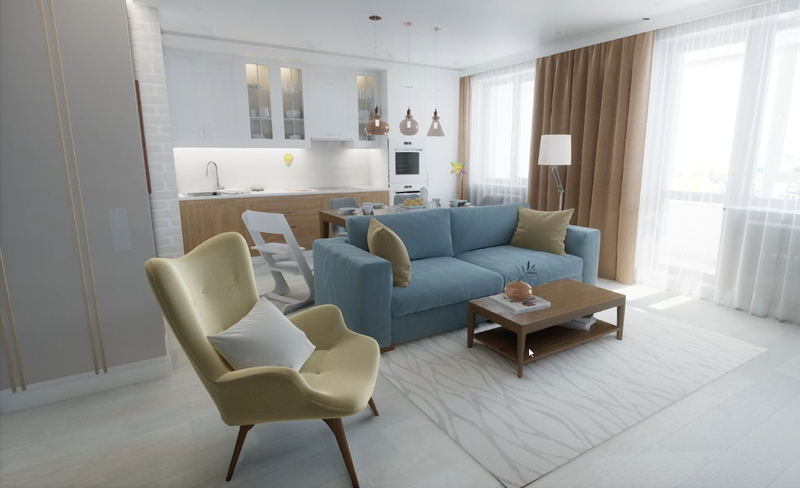 Voxel Probe is a required object for the Bake Lighting feature, which enables you to generate a lighting texture for the probe and simulate global illumination with indirect lighting for both, interiors and outdoor scenes. On the Menu bar, click Create -> Light -> Voxel Probe. Place the probe somewhere in the world. 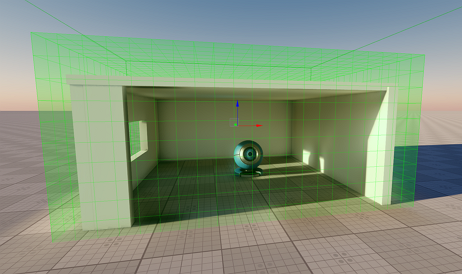 Bake Lighting or set the Texture parameter by choosing a prebaked lighting texture from assets. 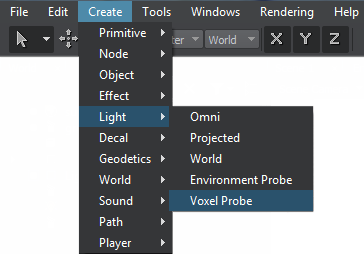 Parameters of the voxel probe light are available in the Voxel Probe tab of the Parameters window. It includes both the common and the specific parameters. A set of specific ones is described below. Specifies the size of the box volume. Sets the size of a voxel. If the Box Size is not divisible to the Voxel Size without remainder, the voxel probe uses the lowest volume of voxels covering the box. These two parameters define the resolution of the voxel probe. Note that the memory usage is cubically dependent on the resolution, double growth of the voxel size causes eight-times growth of the size of the lighting texture. Enables the additive blending mode for the voxel probe. This option offers more flexibility in lighting control. You can use it to blend lighting of several voxel probes together and control them separately (e.g. make a separate voxel probe for an indoor emissive light source and blend it with another voxel probe with lighting baked from the sky, having the ability to enable and disable them separately). Voxel probes with additive blending enabled cannot be used as insets to add lighting details (e.g. creating a small high-detail voxel probe inside a large low-detail one). Such probes do not replace each other, as they are blended instead. Enables the influence of sun light color on the voxel probe. When enabled, this option makes the voxel probe color black at night, or orange at sunset. Sets the bias of ambient lighting by adjusting the voxels offset for fine tuning. Enables the cubic filtering of ambient lighting. When disabled, the linear filtering is used. Sets the color of the reflection. Sets the intensity of voxel probe's reflection. 0 value means no reflection. The roughness range helps to choose between diffuse reflection of the voxel probe and other ones (reflection from an environment probe, the environment cubemap) for all materials having the Roughness parameter. Sets the bias of reflection by adjusting the voxels offset for fine tuning. Enables the cubic filtering of reflection. 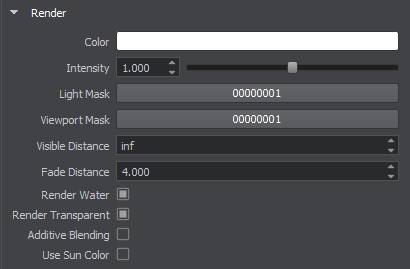 The following parameters describe the way the light shall be baked inside the probe, so you need to re-bake lighting, when you make changes to these parameters. Sets the baking viewport mask which specifies the surfaces to be baked basing on their material's Viewport Mask. Sets the sampling resolution of the voxel probe. Sets the sampling mip offset of the voxel probe. Sets the number of rays casted for each sample during light baking. 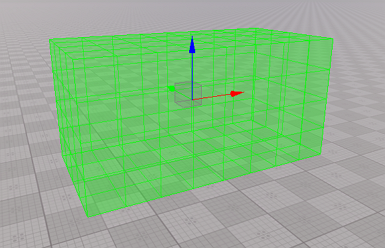 Sets the distance to the far clipping plane used for every voxel during light baking. The minimum value of 0 corresponds to disabled correction. The maximum value of 1 equals maximum correction. Sets the distance on which light bleeding is fixed. Enables light bleeding correction of Voxel Probe. Enables internal volume baking of Voxel Probe. Enabled option corresponds to baking all voxels of the probe. Disabled option equals baking the voxels that cover geometry and skipping the empty ones. Having baked internal volume makes it possible to realistically shade dynamic objects that move inside the voxel probe as the lighting texture is projected onto all the geometry. If the option is disabled, the lighting is interpolated between neighboring voxels. Enables calculation of bounces at full resolution. Defines whether indirect light bounces are computed at the same full resolution as the last one or the resolution should increase from the lowest to full with each bounce iteration. Enables caustics calculation for the voxel probe. 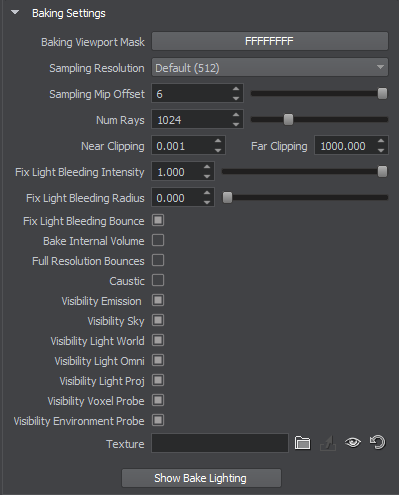 You can use the following 7 visibility options together with additive blending to provide more flexibility in light baking. Thus, you can make voxel probes independent of each other and combine them to produce some sort of dynamic GI effect. Enables baking of emission light sources to the voxel probe. Enables baking of lighting from the sky to the voxel probe. Enables baking of world light sources to the voxel probe. 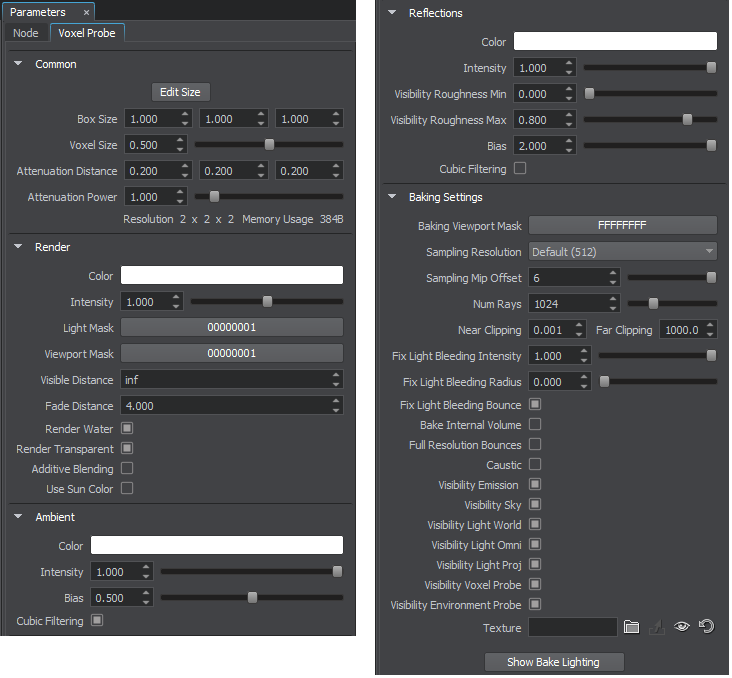 Enables baking of omni light sources to the voxel probe. Enables baking of projected light sources to the voxel probe. Enables baking of other voxel probe light sources to the voxel probe. Enables baking of environment probe light sources to the voxel probe. Sets the 3D lighting texture. Every bake lighting procedure makes changes to the asset which is set for this parameter.